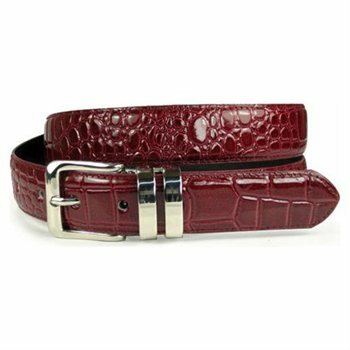 This one-size-fits-all feather edged Croco print belt features removable buckle that allows you to make any size you want simply by removing the buckle, cutting the belt strap and then clamp the buckle on. The original full length of the belt strap is 45″ Material: 50% leather, 50% pu – man made leather Width: 1 1/8″ (30mm) Imported Size:One Size Fits All(Whole Length:45″)Notes: please be aware that one-size-fits-all does not mean it includes plus size. The full length of the belt strap is 45″. It fits all measurement less than 40″. Available in five fun colors:Red, Yellow, Aqua, Cream and Pink. To select a color, click “Biu Now”.